After giving a thorough rundown of the GL551JM's system performance – how well it handles downloading, uploading, movie loading, data compression and streaming – it's now time to take a look at how well the GL551JM handles what it was built for: gaming. The Republic of Gamers laptop is, through and through, a gaming laptop. It's packed with an Nvida GeForce GTX 860M 2GB GDDR5 GPU. “Smoking hot” doesn't just describe how much heat this thing can generate, it also describes how fast it and smooth it can run games. 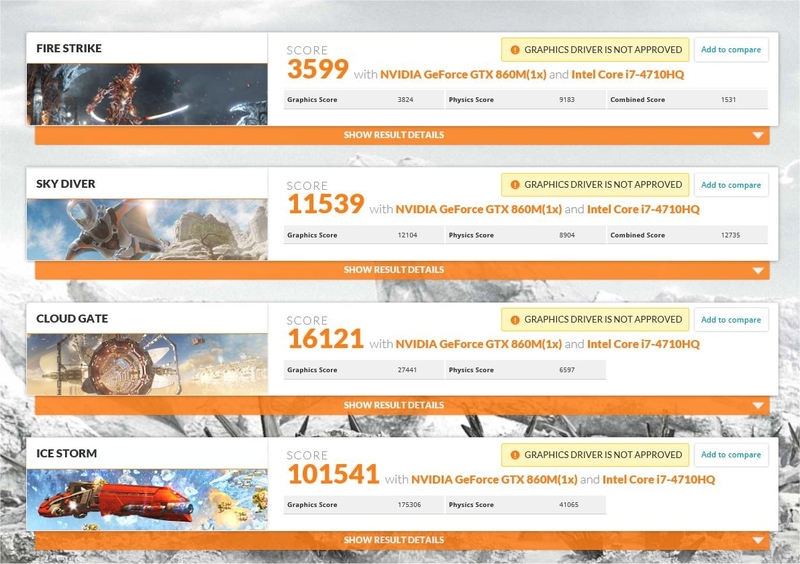 The most basic of benchmarking tests was conducted with Futuremark Studios' 3DMark. The tests results are pretty positive. For a $1,000 machine the GL551JM managed to perform better than 33% of the machines that were benchmarked. You can check out the results here. An image of the benchmarks is also below. The Fire Storm performed the worse, obviously. It just brought the whole thing down to a crawl, averaging 15fps. The highest was 20fps and the lowest was 6fps. The physics test for Fire Storm were quite impressive, averaging 60fps. However, the particle effects absolutely murdered the performance. The Cavern demo dropped to around 24fps at frame 2400 during the long-shot of the arcade crumbling, and the Wingsuit demo performed superbly up until the pilot landed and there was a slight stutter during the fly-by when the LOD was transitioning into the post-processing depth of field effect. Otherwise, the GL551JM handled the benchmarks like a champ, but it certainly didn't come close to high-end gaming rigs rocking an Nvidia GTX Titan. Then again, those cards run the cost of the GL551JM, so... you get what you pay for. The pedantic benchmarks are good for systematic number matching and comparisons, but I've always been more interested in real-world tests. So I gave the laptop a run in various games, including DiRT 3, to see how well it handled consistent, fast-paced frame-rendering with a lot of graphical effects taking place. Running on the max settings – and outputting through both the laptop screen and a television – DiRT 3 ran at a consistent 60fps, with a very minor drop to 47fps during busy segments involving a lot of environmental screen real-estate. Even when running Fraps, DiRT 3 maintained 60fps at 1920 x 1080 resolution with the GPU averaging 78 degrees Celsius, and there's even some footage below so you can see it in action (unfortunately YouTube doesn't support 60fps, so it may look like there's more stutter than what was actually present). I wanted to further test how well the system ran games with really fast frame refresh rates, so I booted up Sonic Generations, but unfortunately the game didn't recognize the Nvidia GPU, so it defaulted to the Intel 4000. I had to turn all the graphics off and scale down the resolution in order to hit 60fps in Sonic Generations with the embedded Intel chip. Moving back to the graphics-heavy games... Red Orchestra 2 was put to the test, and absolutely maxed out the game didn't drop below 60fps. 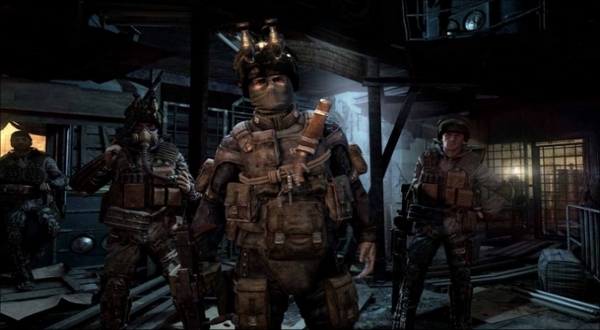 On the slightly higher scale of tests was Metro 2033, a game absolutely known for crippling GPUs on the max settings. I can attest that even maxed out the game ran fine maxed out, with some segments peaking at 60fps but most intense moments averaging 30fps or dipping slightly below... that is, until the system activated a fail-safe and shutdown. I tried this a couple of times and ended up with the same results: max graphics settings, playing through the early part of the game, and then it shuts down. The CPU core temperatures were recorded at 74c for core 1 and 4 ,and 76c for core 2 and 3. The GPU averaged 78c but peaked at around 86c. I turned off MSAA 4x and left basic anti-aliasing on and the system never shutdown after that while playing Metro 2033. Funnily enough, I never ran into the issue of the system overheating with the Metro 2033 benchmark, even when running it multiple times. 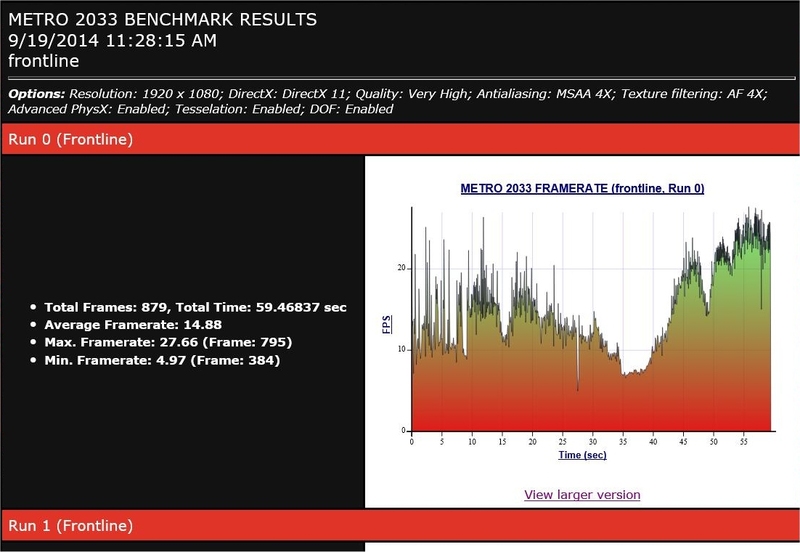 As you can see, MSAA 4x was turned on in the benchmarks. That's one of the reasons I don't always like relying solely on manufactured benchmarks, because they give you theoretical results from within a controlled environment, where-as actually playing the game will render some unforeseen circumstance to better gauge performance. Of course, when playing games most people will probably want to know how well the GL551JM handles open-world titles. I decided that Just Cause 2 was far too optimized for a benchmark, as even low-end systems can run that game quite well. GTA IV is far too unoptimized for a benchmark, and even high-end systems sometimes can't run that game quite so well. I decided that a middle of the road approach would be Sleeping Dogs. The benchmarks were not so impressive when running it on the extreme graphics settings, maxed out at 1920 x 1080, with the textures, post-processing and particles all turned up to the extreme. You can see how well it ran with some of the YouTube footage below. In this case, it never peaked above 27fps. It dropped down to 16fps rather frequently and the lowest was 8fps when there were a lot of light shaders, physics effects and multiple characters on the screen. Keep in mind that this doesn't mean the GL551JM is bad, not by a long shot. It just means that running everything absolutely maxed out at 1920 x 1080 won't render at a consistent 60fps for some games. You'll have to turn down some features or turn off other features altogether to maintain a consistent frame-rate. Even still. I was very impressed with how fast, how smooth and quickly it managed to boot up games, load levels and maintain system performance integrity even while some benchmarks or games were running all day long. The basic question becomes: is the GL551JM good for playing games? The answer is: yes. Another question would be: is the GL551JM future-proof? For running games at minimum and medium-to-high settings: yes. However, you won't be able to play every game maxed out at 1920 x 1080. You might be able to get the resolution but you'll have to tone down the shadow maps, particles or some post-processing effects. Alternatively, you might be able to keep everything maxed out, but at the cost of lowering the resolution. You'll still have to give and take based on the kind of games you play and how you want them to look while you play them. Stay tuned for the upcoming article detailing how well the GL551JM works as a substitute for living room console gaming, as well as the final review. For more information about the gaming laptop, feel free to visit the official website.